The temple of Kheer Bhawani is situated in the village Maheshaspora, Tullmulla, which is 25 Km north of Srinagar city in Ganderbal district. This temple is highly revered by the Kashmiri Pandit community of the State .The temple is dedicated to Hindu Goddess Ragnya Devi. An annual festival is held here on the Jesht Astami (May-June) when Hindus visit the temple in large numbers to offer prayer to seek the blessing of the deity. Devotees also throng on every Shulka Paksh Ashtami round the year and perform hawan to please the mother Goddess. 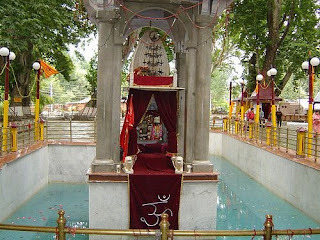 The historic temple of Kheer Bhawani was built by the then the Dogra ruler of Jammu and Kashmir. Maharaja Pratap Singh. Later it was renovated by Maharaja Hari Singh in 1912. It is being said that Lord Hanuman obeyed and carried the Godess on her shoulders and enterd this great valley and on Goddesses direction selected this place and Goddess entered into this spring which becomes the abode of Godess Ragnya\Sharika. The temple is fondly called Kheer Bhawani because of the countless devotees who over the centuries offered milk, sugar, rice pudding or Kheer to the scared spring. This is an incarnation of Goddess Durga Mata the local name of the Goddess is Ragnya or Raginia. The small temple made of white marble-pillared canopy is located in the middle of a natural spring or Kund, the walls of which are hexagonal in shape. A tiny footbridge over the spring leads to the temple. There are many clear water streams around the temple and many Chinar trees in and around complex provide shade to the devotees. The devotees make offerings of flowers, lamps and of course kheer (traditional condensed milk) and pray for the well being of their family. Round the year thousands of devotees offer kheer at the feet of the goddess- it is believed that if your future holds something ominous, the goddess, knowing that would immediately turn the white kheer black making you careful and aware of your impending doom. Keeping in view the huge inflow of Yatris, some residential quarters were constructed in the vicinity to accommodate them, particularly during inclement weather.To serve the devotees, some voluntary organisations arrange langers for yatris. Even army and paramilitary forces come forward to serve food and prasad. This mela usually lasts for three days. After which devotees rush to their homes-blessed and blissed. The mela provides an apportunity to local businessmen to do some business. They sell milk, flowers and earthen lamps to the pilgrims.